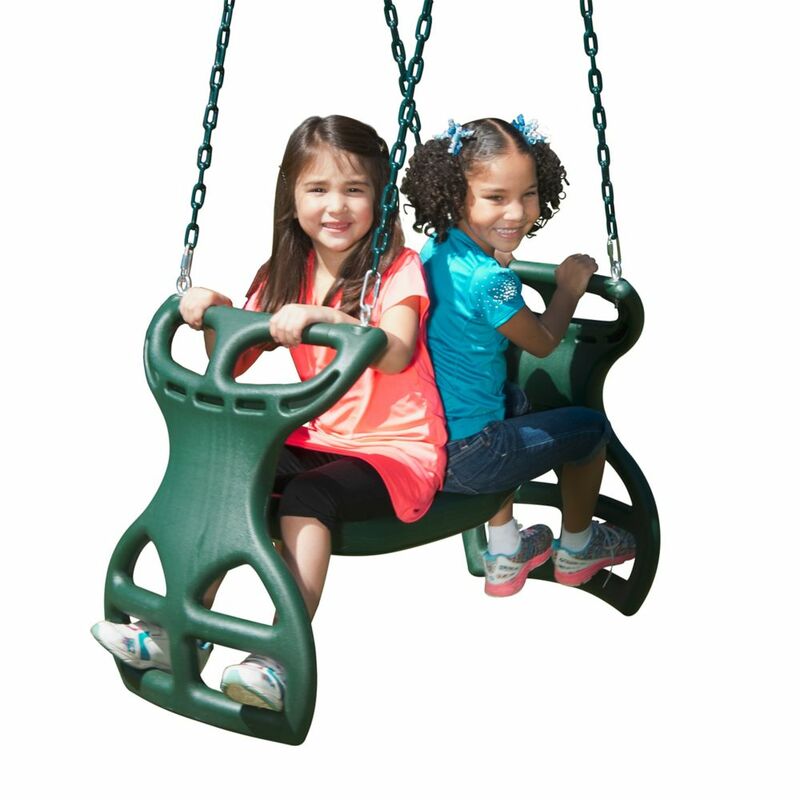 The green Dual-Ride Glider provides 1 or 2 children hours of gliding fun. With its back-to-back swing design, your child can fly solo or invite a co-captain to fly with him or her. The built-in handlebars and foot loops provide a comfortable ride for the children. Features heavy duty plastic construction with plastisol coated chains to prevent pinching. Swing hangers sold separately. The newly introducd blue/yellow Dual-Ride Glider provides 1 or 2 children hours of gliding fun. With its back-to-back swing design, your child can fly solo or invite a co-captain to fly with him or her. The built-in handlebars and foot loops provide a comfortable ride for the children. Features heavy duty plastic construction with plastisol coated chains to prevent pinching. Swing hangers sold separately. Dual-Ride Glider in Green The green Dual-Ride Glider provides 1 or 2 children hours of gliding fun. With its back-to-back swing design, your child can fly solo or invite a co-captain to fly with him or her. The built-in handlebars and foot loops provide a comfortable ride for the children. Features heavy duty plastic construction with plastisol coated chains to prevent pinching. Swing hangers sold separately. Dual-Ride Glider in Green is rated 4.2 out of 5 by 23. Rated 1 out of 5 by Unhappymom from Missing parts Arrived with most parts missing. Shipping was very slow. Rated 4 out of 5 by MRM from It was easy to assemble, but came with one two... It was easy to assemble, but came with one two few lock washers. Rated 1 out of 5 by Unhappy from The glider arrived today with no chain, no bolts, no lock nuts, no metal parts to put the glider ... The glider arrived today with no chain, no bolts, no lock nuts, no metal parts to put the glider together. The only thing in the box was the two plastic glider ends and seat. I called customer service and I have to wait another 5 days for delivery of another glider. The glider was for a birthday present for my grandson. TODAY is his birthday. Now what......I am angry. There is no excuse for missing parts. Too many other reviews stated the same issue with this product. Unbelievable!!! Rated 5 out of 5 by HomeDepotCustomer from Very sturdy! My grandsons love it! Fairly easy... Very sturdy! My grandsons love it! Fairly easy to assemble. Would definitely recommend.